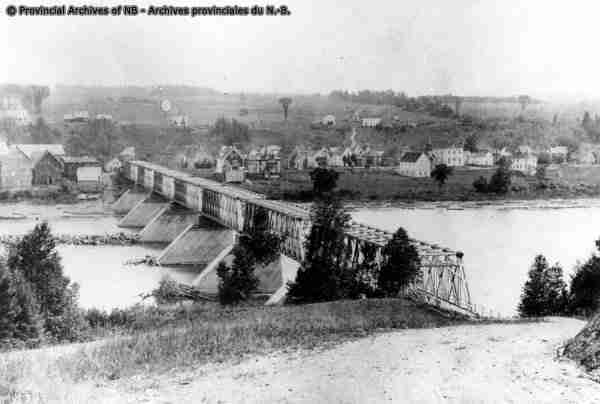 In the 1860s the Saint John River valley was extremely productive at producing hundreds to thousands of bushels of oats and buckwheat flour. Families settled along the riverbanks and the farmers found their way to the market by using the river. However, this was limited during the spring break up and winter freeze, spring floods, and summer shallow waters. Ferries, towboats and even steamers used the river only in ideal conditions. The railroad came to Hartland in 1874 and with the settlement of more farms there was an increase in produce however, there was a problem, getting this produce to markets. The farmers found it frustrating to look across the river and see a perfectly promising quick way to markets by using the railroad instead of going to Florenceville or Woodstock, a minimal two day trip. The retail businesses also enjoyed the farmer’s trade when they brought their produce into town. People spent the day trading at the 4 general stores or spent the night in one of the four hotels using their livery stables. 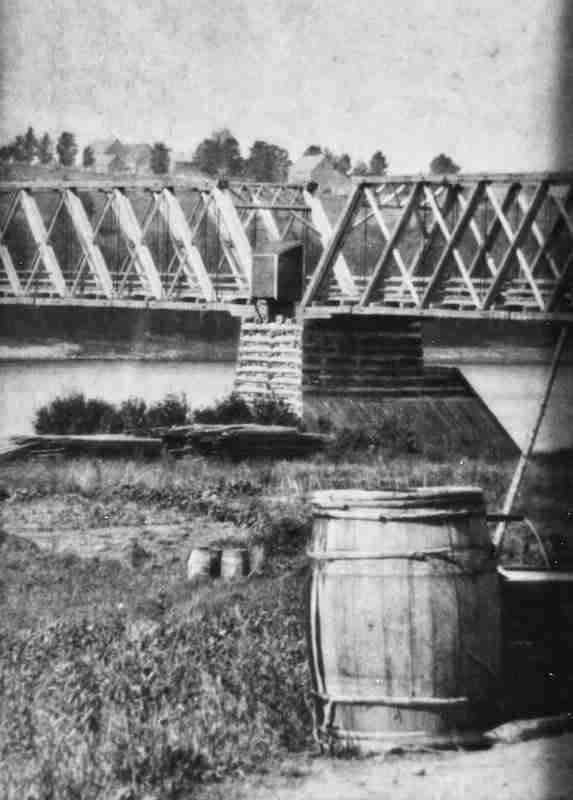 The movement for a steel bridge began in the 1870s and got stronger until finally in 1890 a delegation of men representing both sides of the river went to the government with convincing arguments for the need of a bridge at Hartland. But, they got a flat no. The government just built the steel bridge in Florenceville 12 miles up river and there was no money. 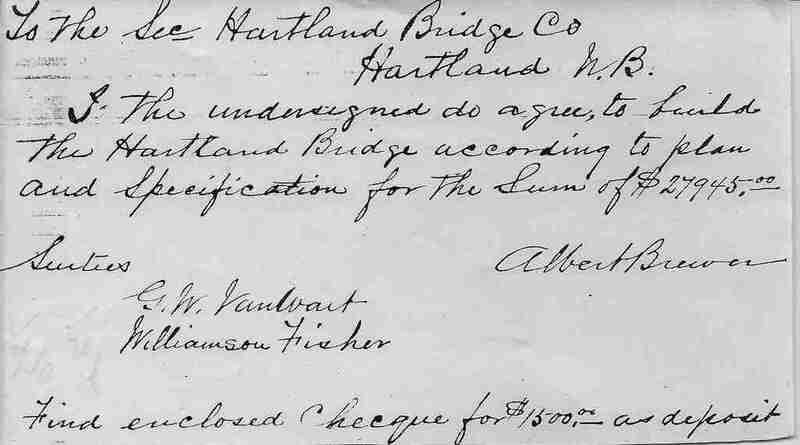 The group did not give up and formed the Hartland Bridge Company and sold bonds to raise funds to build a bridge. Charles McCormack was a bridge builder by trade and he became the President and later the superintendent of the building of it. 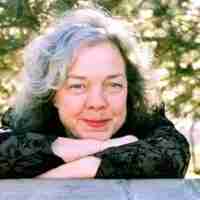 Other executive members were a druggist, a doctor, a carpenter, a businessman, and a farmer. Tenders for the building of the bridge were received and Albert Brewer & Com. from Woodstock won the tender. The tender to build was $27,945. Near the end of the construction the cost rose to $29,421.74. It began in 1898 with construction of the piers. Six wood hollow grids were made and filled with farmer’s rocks from their fields. That took the majority of the first year. The second and third year they began span by span using Howe Truss construction and making individual bridges to put on the six piers with two wood abutments. It was a marvellous fete! Extraordinary accomplishment by determined communities. 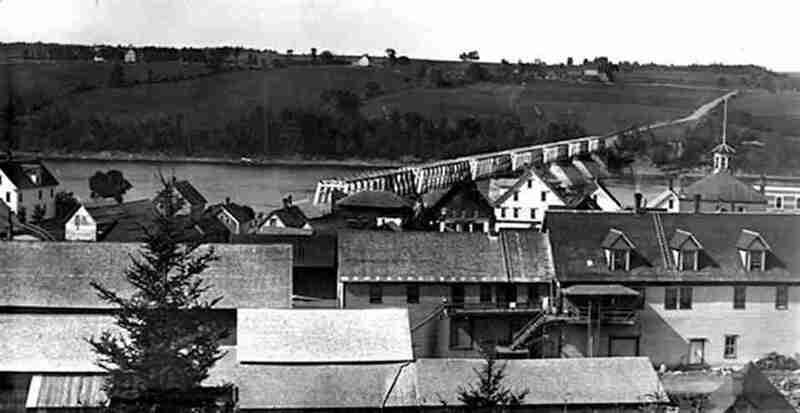 The mounting climax to complete and open to the citizens was scheduled for May 14th 1901, however, Dr. Estey received an emergency call to the Somerville side on May 13 and the workers threw down some boards to let him pass and that became the unofficial opening of the bridge. On May 30, 1901 Charles A McCormack, the superintendent of construction, had the pleasure of writing a long awaited letter to himself, the President of the Hartland Bridge Company indicating his job was complete. This letter was sent on to the provincial government as well. The actual historical official opening did not occur until July 4, 1901. Premier Tweedie and government officials arrived by train to Hartland and celebrated the official opening. It was estimated 5,000 people were in attendance for the grand parade and celebratory ribbon cutting and dinner. The bridge opened as a toll bridge to offset cost of maintenance so a toll building was constructed on the Hartland side and a tollgate keeper was employed. Since he was there all day he had to supply his own oil for his lamp to keep him warm but the Bridge Company built him a privy on the bridge between the first and second span. In 1901 the Hartland (uncovered) toll bridge was officially opened to the public and as you can imagine it wasn’t long before the tolls became a nuisance to the locals. Costs were; 3 cents per person each way, 6 cents per single rig with not more then 2 people one way, 12 cents for a double team with more then 3 people one way, 1/2 cent per head each way for sheep, and 3 cents per head each way for cattle. There was an opportunity to buy 25 tickets at 16 2/3% discount. Just after a year since it opened, a delegation of town folks went to Fredericton with petition in hand to get the tolls removed and the bridge taken over by the government, nothing happened. In 1903 the Hartland Bridge Company made concessions for funerals allowing the processions to go over and back toll free. People on foot crossed toll free from 12 pm Saturday until 12 pm Sunday each week and eventually tolls were reduced by 1/3 throughout. 1906 was an election year and the platform for Hartland included a toll free bridge and the government take over the bridge. Sure enough, it happened but very quietly. After the election there was no hoop roar or celebration. The only thing that happened to indicate the bridge was free was James Pearson, the tollgate keeper, failed to show up for work. It would seem life was good for the little Hamlet snuggled in the Saint John River Valley connected by their labor of love monument, the bridge. Life was good until July 15, 1907. 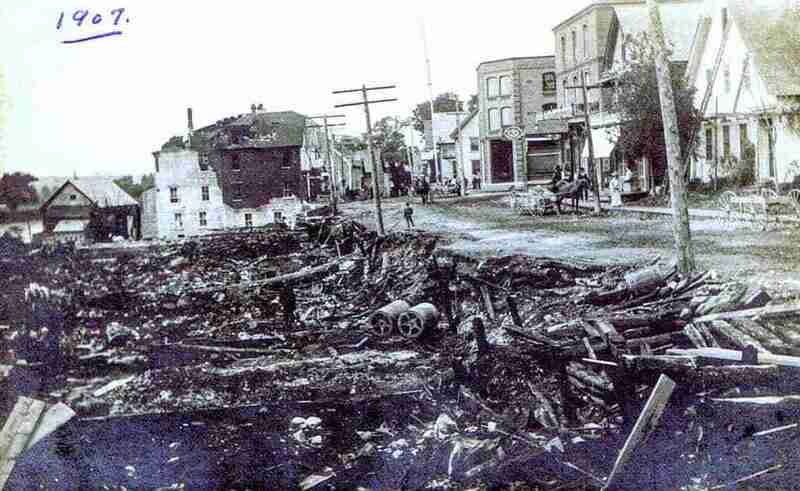 At 1 am on Monday morning a fire broke out to the rear of W. F. Thornton’s Drug Store. The fire bell only needed to be tapped twice to have people flying from doorways with pails and anything they could find to combat a fire. 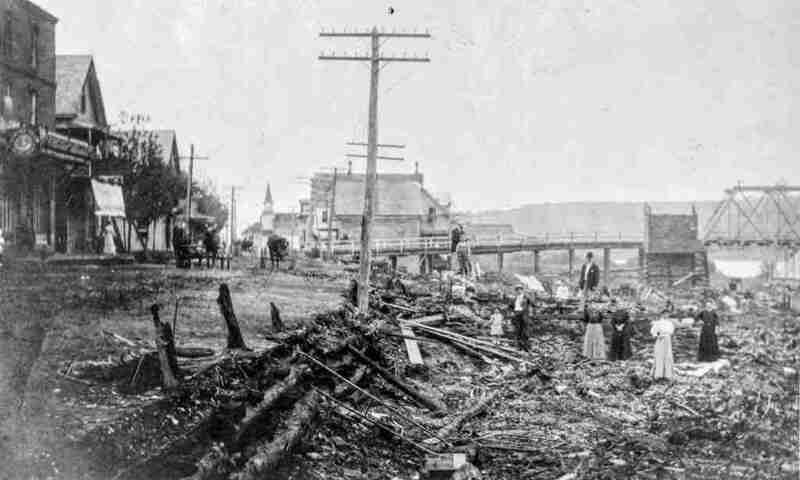 Before the fire apparatus arrived at the scene the flames were soaring skyward and crawling under the connected wood boardwalk engulfing and challenging other buildings in its path including the new wood river bridge. Dry weathered wood buildings and boardwalks that had stood since the early 1860s fell prey to its worst enemy. Surrounding communities were contacted to bring what they could for battle. Woodstock’s apparatus arrived by rail but it was a weekend and the CPR roundhouse was cold and it took three hours to get the steam up to make a fast 13-mile trip. The men were exhausted and the fire was tireless. Finding that a person had cut two joints in the water hose and the water barrels on the bridge were completely dry hindered control. A great focus was dedicated to the bridge and it did catch fire but fortunately the approach and the toll building were partially burned but the remaining structure was unscathed. Up to fifteen businesses or more at the street level were lost and many family residences and professional offices that were above the businesses were also lost, a devastating blow, but the bridge lived through it. 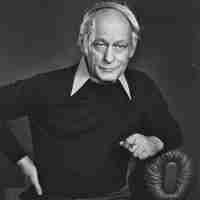 Unsubstantiated blame was circulating but the cause unfounded. By 1913 the uncovered bridge was showing its wear. 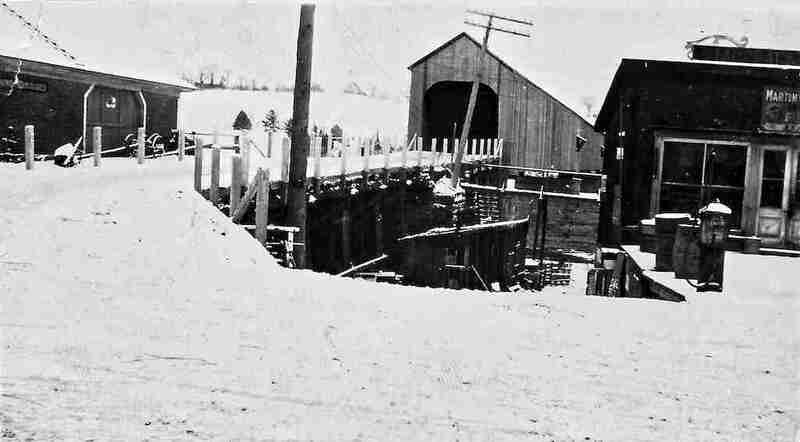 During the winter, snow was hauled for the floorboards so the sleighs would not cause friction, the rain and sun weathered the wooden trusses, boards, stringers and the melts and animal excrement lend to a deteriorated bridge. The Provincial Highway Superintendent inspected the Hartland Bridge and informed the Premier the bridge was deteriorating at a rapid rate. Discussions began about replacing the bridge with steel. But between 1913 and 1919, the war years, the bridge was patched with only necessary repairs. After a political change the new Public Works Minister took a stand. Something had to be done to the Hartland Bridge. Piers 2, 4, and 5 were damaged from ice and log drives and jams. Another thorough inspection reported a new bridge should be built. Steel was too expensive so a wood structure would replace it. Twenty years ago the townspeople would have loved to have the government build a bridge but this new report was met with great opposition. The people did not want a new bridge; they did not want to resort to ferries again. 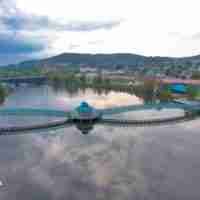 A compromise was made and the plan was to do necessary repairs to strengthen the structure, replace the wooden piers with concrete and cover the entire structure to protect it from weather elements. They would do it in phases. This was palpable to the community but the citizens still requested a steel bridge. The bridge was closed; ice bridges and ferries returned, and the necessary repairs were started for phase one. A main supporting cord was discovered damaged due to the river drivers. They hitched tackle to the bridge and used heavy teams for the purpose of pulling the jams away from the bridge. The work continued and the bridge was to reopen to traffic April 6, 1920. Spirits were high but the rain began that weekend. Not a light rain but a downpour and the ice started to break up and run. It jammed on the island and the channel below the bridge and the water level began to rise, six feet in 10 minutes. At noon on April 6, 1920 the very day the bridge was to reopen two western spans and one pier were washed down the river. The horror the people dreaded the most happened, back to the ferry and ice bridges and the lack of possibilities to cross the river. The communities opposite the town were without mail, telephone or markets. Sixty percent of the trade of the town came from the farmers on the west side of the river. Fertilizer for the season’s crop was still not obtained, new machinery bought and ready to be hauled across the river was still on the Hartland side and hay sold couldn’t get to the market. Now they had to drive 24 miles one way to get to established markets. This was a disaster. Within a month, the Superintendent developed new plans. The two western spans, the west abutment and the one pier be replaced with wood as phase one with the new pier made with concrete. The next phase built remaining piers of concrete and the bridge moved from the wooden piers onto the new concrete piers. And the final phase would be to cover the entire bridge with wood. Eleven months later the first phase was completed and on March 1, 1921 it was reported the bridge was open to the public. 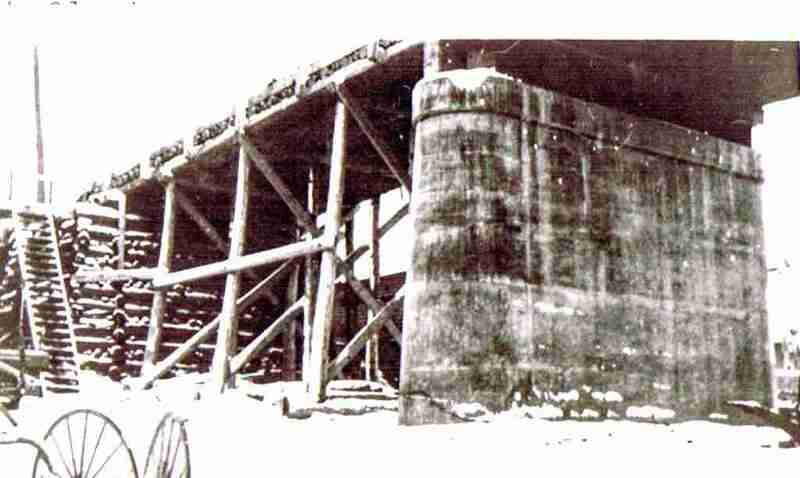 By September 1921 the new concrete piers were finished. All bridge spans were elevated 30 inches and moved westward 20 feet on to the new piers by October 20th and done without any interruption to traffic. Covering the bridge began immediately and was completed by December 1921. Almost immediately after the bridge was covered there was no traffic over the bridge after dark. Parents were concerned for their daughters. The covered bridge was a long tunnel as far as they were concerned and they did not approve of their daughters taking a casual drive in a rig with a young man through the bridge. It was know as a “kissing bridge”. 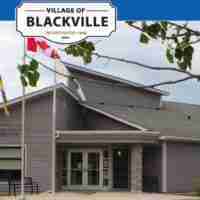 Complaints of its darkness caused an immediate council meeting. It needed lights. They were installed but there is still uncertainty who paid for it, the town or the government. The first reference of the Hartland being the Longest Covered Bridge in the world was in the Observer Newspaper on December 23, 1931. The Saint John Standard newspaper on October 2, 1937 claimed that Norway had the longest bridge but measurements were taken and they found the Norway Bridge was 200 feet shorter. The claim to have the Longest Covered Bridge in the World was confirmed without disputed and publically declared by the Indiana Historical Timber Bridge Committee and has held to this day. 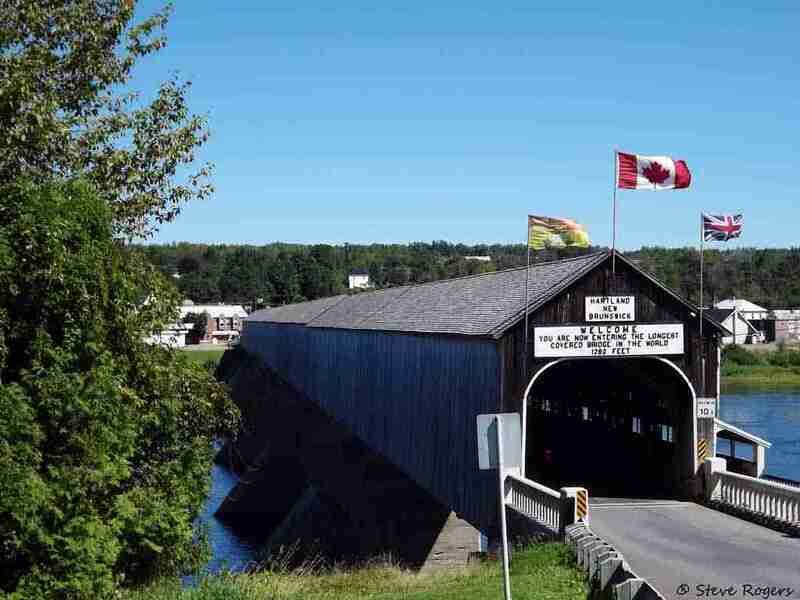 The bridge was declared a National Historic Site in 1980 and a Provincial Historic Site in 1999. 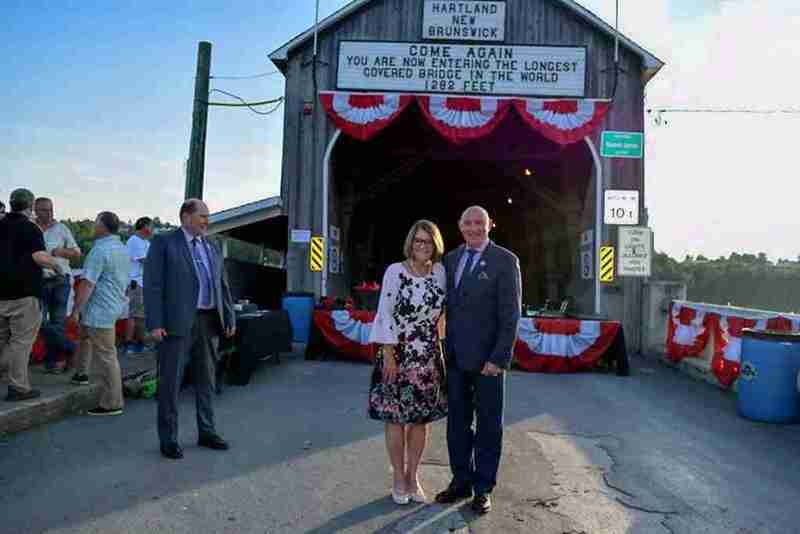 On July 4, 2001 The Town of Hartland celebrated the Covered Bridge’s 100th birthday by re-enacting the original opening day of 1901 with a parade, ribbon cutting ceremony and a dinner followed by modern fireworks and dancing on the bridge’s ramp. There have been many pictures, thousands taken, of the bridge for various reasons; weddings, graduations, vacations, school class pictures, basketball teams, family photos. On August 5, 2018 there was a first. 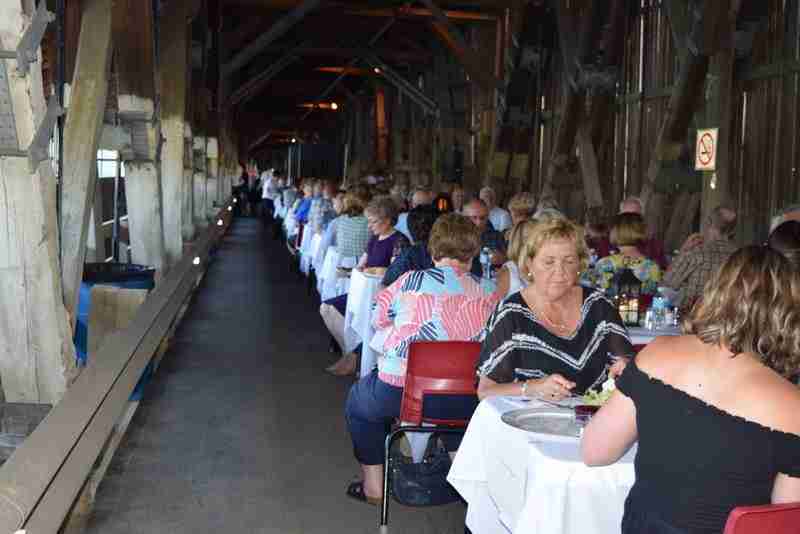 The Town of Hartland turned 100 years old since their incorporation in 1918 and an anniversary committee provided a dinner and dance on the Hartland Covered Bridge serving 500 people a full course meal. The Lieutenant Governor was present for the occasion. After the meal people danced on the ramp of the bridge to a live band while watching fireworks explode in celebration. This post has already been read 937 times!